In over 200 years, the world has experienced four major industrial revolutions. While the first implemented steam power for mechanized production, the second was based on electric power to drive mass production, the third used electronics and computing to automate this production, and finally the fourth used digital technologies to radically change the way we interact and connect, the way we work and live and even the way we may view the world of today. This fourth revolution addresses a new way of sharing information that deals with massive and exponentially incremental data creation and storage as well as data traffic at global scales, in most cases, driven by new fast growing technologies such as the Internet of Things, Big data, virtual reality, autonomous vehicles and other applications of artificial intelligence. Many of this information, e.g. related to health, finance or even defence-related communication, is extremely sensitive and needs to be handled with protocols and procedures that ensure the highest degree of security. Present day cryptography is in danger due to the advent of quantum computers, which will instantly break most methods currently considered secure and widely used. Quantum cryptography brings new methods, systems and protocols that cannot be broken by any computer at all, present or future. For this reason, current cryptography can be extended to also include quantum cryptography, which rely on the foundation of quantum mechanics to add a future-proof physical/hardware layer to the overall security-protecting architecture of the communication infrastructures. Quantum Key Distribution (QKD) is the most widely used among quantum cryptography protocols. Since its inception in the late 80s, the advances in QKD have been extraordinary. However, its potential for applications in cybersecurity has not yet been fully exploited. Thus, significant challenges still remain, mainly because the QKD systems currently used for specific security services are often expensive, exhibit poor flexibility, and cannot operate seamlessly in telecommunication networks. The new European project CiViQ (Continuous Variable Quantum Communications) will focus on solving these challenges. 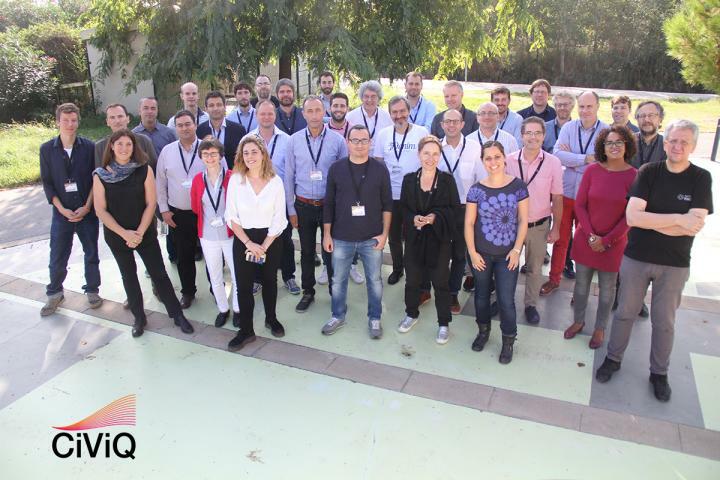 Selected as one of the 20 projects to start the Quantum Flagship (an ambitious 1b€ initiative supported by the European Commission over the next 10 years), CiViQ aims at developing flexible and low-cost QKD systems that can be integrated easily into emerging telecommunication infrastructures. It will also put forward novel quantum cryptography systems and protocols, with the ultimate goal of offering accessible, innovative services to individuals, industries and institutions and thus to meet the needs of the secure telecommunications market. ICREA Prof. at ICFO Valerio Pruneri, coordinator of the project, comments "In the next three years, CiViQ will put together technology to meet specific network security requirements. An end-user driven approach together with flexible integration into telecommunication networks are a prerequisite for a successful impact on the cryptography and cybersecurity markets." To do this, the project brings together a consortium of 21 partners that cover the entire supply chain of QKD, from academic research groups, component manufacturers, industrial equipment suppliers and telecommunication network operators/end users. 5 Research Institutes, 6 Universities, 2 SMEs, and 8 large companies will contribute through research in areas that include, among others, quantum protocol design and security analysis, certification, integrated photonics, and, system and network engineering. The partners will combine their expertise to ultimately promote quantum-enhanced security services and drive the creation of novel commercial applications, strengthening the competitiveness of the European Ecosystem in the field of Quantum Technologies. This project has received funding from the European Union's Horizon 2020 research and innovation programme under grant agreement No 820466. In quantum mechanics, unknown quantum states cannot be perfectly cloned. Thus, when distributing quantum states between two parties, any information gain by a third party (a spy or eavesdropper) will disturb the transmitted quantum states. Quantum mechanics allows the two parties to estimate the level of information gain by a third party and to generate a secure distributed key from the information on the transmitted and measured/received quantum states. This key then can be used for encryption purposes to enable secure communication. The minimum requirement for using QKD is to generate non-orthogonal quantum states in the distribution process. Several encoding schemes have been proposed that ultimately rely on the expensive and bulky single photon detection technique. CiViQ focuses on an alternative protocol family in which electric field amplitudes are directly measured using coherent detection (a method widely used in modern coherent optical telecommunication). The measured outcomes are continuous values of the amplitudes of electric fields and the detection technique is the ultimate hallmark of CV-QKD, a technique that will lead to the development of a cheaper technology that can be integrated in many more applications, specifically for industrialization and integration in telecommunication networks. The Quantum Flagship was launched in 2018 as one of the largest and most ambitious research initiatives of the European Union. With a budget of €1 billion and a duration of 10 years, the flagship brings together research institutions, academia, industry, enterprises, and policy makers, in a joint and collaborative initiative on an unprecedented scale. The main objective of the Flagship is to consolidate and expand European scientific leadership and excellence in this research area as well as to transfer quantum physics research from the lab to the market by means of commercial applications and disruptive technologies. With over 5000 researchers from academia and industry involved in this initiative throughout its lifetime, it aims to create the next generation of disruptive technologies that will impact Europe's society, placing the region as a worldwide knowledge-based industry and technological leader in this field.